The importance of monitoring urinary pH, the prevention of catheter encrustations, and the introduction of the use of new, effective medical solutions such as Lit-Control® to prevent urological pathologies, primarily lithiasis, are the major issues put on the table by the specialists during the XXVII National Meeting of the Groups of Lithiasis, Endourology, Laparoscopy and Robotics of the Spanish Association of Urology, held the 26th and 27th January in A Coruña (Spain). Among them, Prof Olivier Traxer from the University of Paris VI, one of the world’s key opinion leaders in this field. 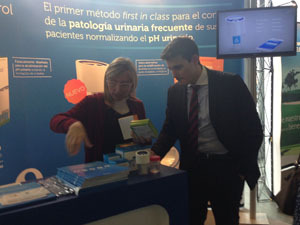 “Urinary pH can induce the direct formation of uric acid calculi (pH <5.5) or calcium phosphate calculi (pH >6.2), that is, lithiasis” remarked Prof Félix Grases, chair professor at the University of the Balearic Islands. Currently in Spain renal and urinary lithiasis (stones in the kidneys, ureters, bladder, or urethra) affects 10% of the population, mostly men, besides the 325,000 new cases that are diagnosed every year according to data from the Ministry of Health. Lithiasis appears on the list of high-prevalence chronic diseases of the EU. 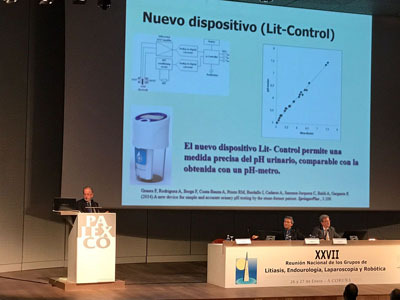 During the medical scientific meeting, Dr Grases presented Lit-Control® pH Meter, the new first-in-class device developed and manufactured by Devicare, as the best solution “that allows an accurate and immediate measurement of urinary pH with freshly obtained urine compared to that performed with a laboratory pH meter”. Dr Sergi Colom from the Bellvitge University Hospital (Barcelona) highlighted the importance of monitoring urinary pH in order to “prevent the encrustation of the catheters through the acidification with L-methionine and phytin”. And this can already be managed thanks to the new food supplement Lit-Control® pH Down by Devicare, with patented formulation, available in the Spanish pharmacies since 2016. “Diet also influences the formation of stones”, explained Dr Carlos Reina from the Hospital of Valme (Sevilla) while Dr Juan Alberto Lancina from the University Hospital Complex A Coruña talked about metabolic syndrome, which affects 25% of the Spanish population, as “another risk factor for urinary lithiasis”. Devicare has been a pioneer in developing a domiciliary method for the self-management of frequent urological pathologies called Lit-Control®. This method is made up by the Lit-Control® pH Meter medical device and the Lit-Control® pH Up and Lit-Control® pH food supplements. The benefits for the patients are that they can monitor and control urinary pH in an easy, quick, convenient, and reliable way, which helps prevent the formation of kidney stones and avoid the recurrence of the infection, among other advantages; and for the physicians, a better follow-up of the patients and a greater adherence to and effectiveness of the treatment. In Spain, Lit Control® is marketed through M4 Pharma and in Mexico with InnovaSalud. In 2017 Devicare expects to introduce it in other countries in Europe and Latin America.